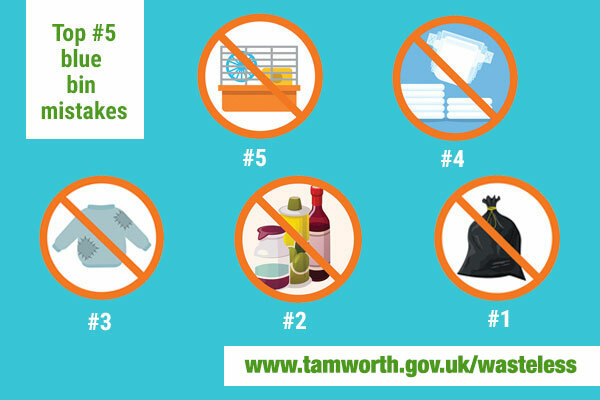 Tamworth Borough Council and Lichfield District Council are counting down the top five blue bin mistakes made by local households in a bid to further improve recycling rates. The Joint Waste Service is highlighting the five most common items that are mistakenly placed in blues with the aim of helping residents to recycle more while preventing the contamination of loads. Coming in at number five is animal bedding, followed by nappies at number four. Whether clean or used, animal bedding and nappies cannot be recycled and should go in black bins. The third most common error is textiles, including old clothes, bedding and towels. The shared waste service is not able to recycle textiles and these should either go to a charity shop, if of a good quality, or a textile recycling collection point. The second most common mistake is food waste. All food and drink containers should be emptied and rinsed out. They don’t need to be spotless, but they do need to have been rinsed. And, the top blue bin ‘no no’ is black bin bags. Recycling should be put loose in blue bins or go in clear plastic bags. This could mean you collect your recycling in a bin liner, but empty it into your blue bin. Putting black bin liners, food waste, textiles, nappies and animal bedding into your blue bin will contaminate the recycling and could mean that it is not emptied. Cllr John Chesworth, Cabinet member for Culture and Operational Services, said: “We know the majority of our residents are committed to recycling and do a really good job. However, some non-recyclable items continue to make their way into blue bins and this can contaminate whole truck-loads of recycling. “Sending waste to be incinerated or to landfill costs more and there’s also the cost to the environment, so recycling more is in all of our interests. To find out what should go in each bin, visit www.tamworth.gov.uk/bins-and-recycling. To download the Waste Less guide which sets out how to recycle, visit www.tamworth.gov.uk/wasteless.